1:22 PMOn the dunk Richter scale, nothing ranks higher than a smash that alters the course of a playoff series. (Well, almost nothing.) The funeral James Harden gave Draymond Green on Tuesday night could turn out to be one of those dunks. We expect Harden to rain treys and cook dudes’ legs into spaghetti, of course. But to bang on Green, probably the best all-around defender in the league? On Green’s home court? Then beat the Warriors for their first home playoff loss since Game 7 of the 2016 Finals, and tie the series 2-2? The momentous aftershocks of Harden’s and-1 (he actually got fouled twice: once by Stephen Curry on the reach-in and again by Green at the rim) included Green short-arming a wide-open dunk and the Dubs flinging brick after brick in the pivotal fourth quarter. Back in 1991, Michael Jordan was still a high-scoring guard who had never won a championship. The future revealed itself in a first-round series against the New York Knicks. Y’all know the legend: MJ evaded a double team from Kiki Vandeweghe and John Starks, shook another double from Starks and Charles Oakley, spun baseline, elevated over the 7-foot Patrick Ewing — and cemented the destiny of two franchises with the and-1. Like Jordan, Shaquille O’Neal and Kobe Bryant had never won a championship when they faced Portland in the 2000 Western Conference finals. After blowing a 3-1 lead, down 15 in the fourth quarter of Game 7, the Los Angeles Lakers mounted a comeback. With 44 seconds left, Bryant dusted Scottie Pippen with an effortless crossover, knifed into the lane and lobbed a big piece of barbecue chicken up for the big fella. Lakers up 6. Three straight ’chips came next. In 2007, a ringless LeBron James was down 0-2 against the Detroit Pistons in the Eastern Conference finals. With the score tied deep in the fourth quarter, James blew past two defenders and destroyed Rasheed Wallace, plus the foul. That set the stage for James’ 32 points, a series-swinging win, his first Finals appearance — and too many more playoff posters to count. Does Houston want to have a problem — or do they want to be the problem? This year’s Houston Rockets are an all-time great offensive juggernaut. The franchise broke its own record for 3-pointers made in a season this year. But here’s the thing — beating the defending champions in regular-season matchups, as they did two out of three times, is a completely different animal from trying to beat them four times in less than two weeks. Chris Paul waited his entire career to advance to the NBA’s final four, and it’ll likely end in five if the Rockets put on a repeat performance of their Game 3 curb-stomping. As currently constructed, the Warriors represent the love child of the “Greatest Show on Turf” St. Louis Rams and 2001 Miami Hurricanes — only the child decided CTE, the lack of guaranteed contracts and football’s stance on social issues were too much to ignore. Golden State is the most overwhelmingly dominant team ever assembled, with four presumptive future Hall of Fame candidates all still very much at their physical apexes. And Stephen Curry and Kevin Durant could very well end up as top-10 players of all time. Now Houston has to beat that same team at home. That same team that hasn’t lost in Oakland since LeBron James’ block and Kyrie Irving’s shot punctuated the greatest Finals comeback in NBA history nearly two years ago. A loss that, by the Warriors’ own admission, delivered them Durant. Oracle Arena hasn’t felt the agony of playoff defeat in 703 days and counting. That’s 16 games in a row — the longest such streak in league history. This is the task sitting on Houston’s shoulders ahead of tonight’s game. Do not bark up that tree, Jay-Z warned his foes on the seminal 2001 diss record “Takeover.” That tree will fall on you / I don’t know why your advisers ain’t forewarn you. The best record in the league, with a team specifically designed for this exact moment, only to sit on the edge of self-destruction. That lyric will haunt the Rockets if they lose tonight. If Harden wants to continue to live under the label of “superstar” without reproach, this is the type of game that notarizes the stamp. Head coach Mike D’Antoni called his team soft after Sunday’s baptism. D’Antoni understands the magnitude, even if he is saying Golden State has “all the pressure” of tonight’s game. D’Antoni is the forefather of the space-and-pace offense: His mid-2000s Phoenix Suns were the kings of it. Now he’s a mad scientist watching his creation turn against him, as the Warriors are a faster, defensively superior and just more crippling version of those Suns. Chris Paul waited his entire career to advance to the NBA’s final four, and it’ll likely end in five if the Rockets put on a repeat performance of their Game 3 curb-stomping. James Harden, the leading MVP candidate (although another James continues to make a case), has had his great season come down to one game. These moments define careers. Big-time players, as Santana Moss once poetically put it, make big-time plays in big-time games. And if Harden wants to continue to live under the label of “superstar” without reproach, this is the type of game that notarizes the stamp. Game 4 on the road? In an all-time hostile environment? With a chance to completely rewrite the narrative of both the series and your postseason career? These are dreams that money, not even Harden’s mammoth contract, can’t buy. 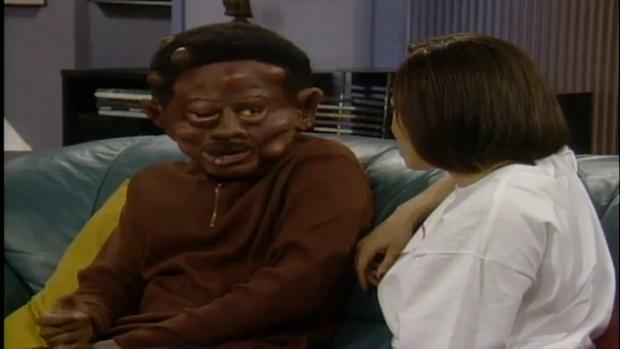 Houston called out Golden State like Martin called out Tommy Hearns in the classic 1994 Martin episode “Guard Your Grill.” And, as it stands right now, the Rockets are a two piece and another Steph Curry biscuit away from looking like Martin after the fight. It’s the “s— or get off the pot” moment for these Houston Rockets. Go back to Houston tied 2-2 and it’s a best-of-three series with potentially two games at home — and the reality that they don’t have to win in Golden State again. Go back to Houston down 3-1 and not even the courtside five of Beyoncé, Bun B, Scarface, Travis Scott and Deshaun Watson would prevent the inevitable. Does Houston want to have a problem or does Houston want to be the problem? Do not bark up that tree. It won’t take long to find out either way.